News Release – WASHINGTON, D.C – The U.S. Department of Agriculture’s (USDA) National Institute of Food and Agriculture (NIFA) today announced more than $8.6 million in available funding to assist low-income individuals and communities in developing local and self-reliant food systems. This funding is available through NIFA’s Community Food Projects Competitive Grant Program, authorized by the 2014 Farm Bill. Inspiration comes from many directions, even from tragedy. That was the case for Randy Bekendam, proprietor of Amy’s Farm, a 10-acre farm located south of Ontario, California. 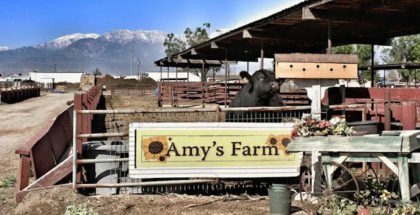 Bekendam runs Amy’s Farm with Amy herself, who is also his daughter. Originally a cattle farm, Bekendam was moved to make a change and do something to bring the community together after a 3-year-old boy was killed by a drive-by shooter in nearby Pomona. Bekendam’s idea? Bring everyone together to heal their neighborhoods by growing food as a community. Press Release – WASHINGTON, Oct. 20, 2016 – The U.S. Department of Agriculture (USDA) today announced the availability of a streamlined version of USDA guaranteed loans, which are tailored for smaller scale farms and urban producers. The program, called EZ Guarantee Loans, uses a simplified application process to help beginning, small, underserved and family farmers and ranchers apply for loans of up to $100,000 from USDA-approved lenders to purchase farmland or finance agricultural operations. Press Release – WASHINGTON, Oct. 6, 2016 – The U.S. Department of Agriculture (USDA) today announced increased federal and private-sector support to expand and diversify the U.S. agricultural workforce by increasing opportunities in education, research and outreach. The announcement is part of the White House Office of Science and Technology Policy (OSTP) and Rural Council initiative, America the Bountiful, a collaboration with federal agencies and private-sector stakeholders to meet the growing demand for a skilled, diverse workforce in the rapidly evolving agricultural landscape. NEW YORK, Sept. 28, 2016 – At the New York Times Food for Tomorrow Conference, Agriculture Secretary Tom Vilsack today announced more than $56 million in grants to strengthen local and regional food systems, support farmers markets, and fund organic research. Since 2009, USDA has invested over $1 billion in more than 40,000 local food businesses and infrastructure projects .